Kraemer replaced the I-35 E Lexington Avenue Bridge, which spans 1,400 feet across the Mississippi River in St. Paul, MN, maintaining two lanes of traffic in each direction at all times. Kraemer completed the majority of the work constructing over the Mississippi River and under the existing structure. 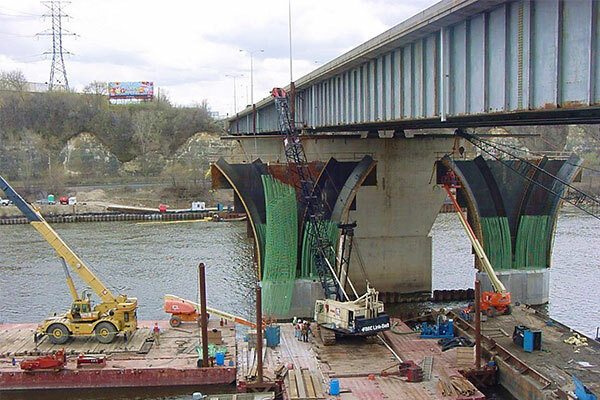 The new substructure was built directly under the old bridge, challenging the project team to drive sheeting and H-pile in a space confined by the existing bridge. The project required four cofferdam structures with a maximum size of 30 feet by 120 feet constructed using 50-foot sheet piling lengths. The superstructure was completed in phases allowing traffic to be switched from the old bridge to the new bridge.